Cracked takes a thoughtful look at what five iconic v8-bit video game characters would look like if their sprites were magically granted life. The results are just a wee bit disturbing. 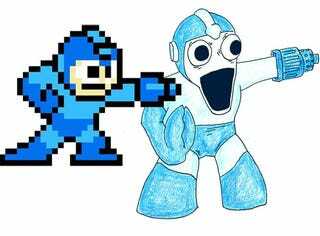 If archeologists in the far future unearthed a blocky, sprite image of Mega Man, what would they think? How would they translate the 8-bit into a real-life creature? Cracked's Robert Brockway uses deductive reasoning to determine just that, with often hilarious results. Its facial features are roughly 70 percent eyes. Being a visually oriented hunter, this is clearly a valuable asset. We can also see the relative size of the mouth is greatly exaggerated. This suggests the Mega Man robot was likely powered on some sort of bioreactor, where the gaping mouth would allow the maximum flexibility in consuming energy sources. Look at the size of the energy containers, for example: They are roughly the width of his entire body. In order to consume power-ups like these, the Mega Man must have had the ability to unhinge its jaw, much like a snake, to accommodate the largest possible energy refills. See? It makes perfect sense, sort of. Robert also takes on Q-Bert, a Space Invader, Pac-Man, and Link. Let's see how Link turned out.